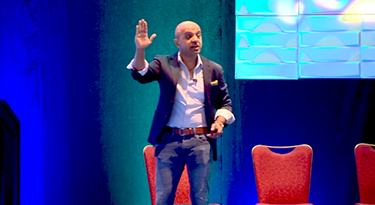 If you’d like to get your most effective on-camera performance in your business videos, there are some things you can do to prepare yourself, your staff and/or your executives who will be appearing in them. A little preparation can go a long way towards producing a video that viewers will want to watch, and that will get your message across. 1. If you’ve spoken at conventions, be aware that the preparation required is not the same. I’ve found that sometimes those who have successfully spoken at conventions or conferences feel that they’ll be able to wing it at the video shoot. Yet it’s a very different delivery. At a conference, everyone knows that you’re reading your notes. Looking down or sounding like you’re reading is no big deal. On camera, that will not come off well. Thing of a video presentation as an individual conversation with one person, instead of an audience. It’s more intimate and you wouldn’t be reading your notes. You’ll need to get much more familiar with the material you’re presenting. Also, at conferences the presenters tend to feed off the energy of the crowd. Naturally this won’t be happening at a video shoot, so you’ll need to get your energy and enthusiasm up on your own. Which leads us to the next point. 2. To prepare for using a script, you’ll either need to memorize the material, or you’ll need to use a Teleprompter. If there are just a couple of lines, memorizing can be a great option. You’ll still want to practice your lines so that they become second nature and can be delivered with a natural feel. If there’s a lot of copy, you’ll want to bring in a TelePrompter. 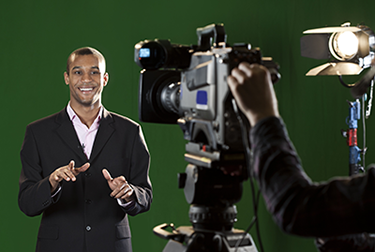 In business videos, even experienced actors and actresses usually need the assistance of a TelePrompter to give a great delivery. Which again, leads us to the next point. Here’s something you’ll want to avoid. One thing that does not work well is to have someone hold up cards with your lines written on them. It causes poor eye contact, and people tend to sound more like they’re reading with this strategy. 3. If your on-camera person will be interviewed, have the expected answers written out in advance. Most people can’t really wing it on camera. Having the ideal answers written out in advance can make things go so much smoother. They should take time on their own to practice giving the answers. This will help them appear more comfortable on camera. They can even practice by visualizing that they’re at a party and having a casual conversation. Or they can have someone prep them by asking them the questions. Also, let your on-camera talent know that they’ll need to paraphrase each question they’re given as part of their answer. So for example, if the interviewer asked “What makes your company so special?”. The interviewee would start out their answer by saying “What makes my company so special is that…”. 4. If you use a TelePrompter, you’ll still need to prepare in advance by practicing the material repeatedly. Without preparation I find that there tends to be more of an impression that the on-camera talent is reading, and it tends to come off as less sincere. It will come out so much better if you’re very familiar with what you’re going to say. Start to get familiar with the script as far in advance as possible, and rehearse it so that it sounds as natural as possible. The script itself should be written in a natural, conversational format, and when you shoot the video you’ll want to sound like you’re having a real conversation. 5. Prepare by deciding on make-up. For men and women both, looking your best on camera is important. If you tend to have shiny skin, or if your skin could use a little help on camera, you’ll need make-up like foundation and/or powder. If you’re not comfortable with applying make-up yourself, you’ll want to have a make-up artist hired who will be on the set to apply it for you. They’ll come with the right tools and colors to make you look your best on camera. 6. Hair preparation should also be considered. Anyone with long hair or frizzy hair may need some preparation. This is especially true if you’re shooting green screen where frizzy or fly-away hair can make a clean image more difficult. Hairspray is a great tool to calm down the hair. Sometimes a change in hair style might be appropriate. While make-up artists don’t do hair styling, they can apply hairspray and comb the hair to calm it down. This is another good reason to consider having a make-up artist on set. 7. Allot the correct amount of shoot time for each person on camera. Sometimes your execs and employees are pressed for time, but they’ll need to have a realistic expectation of the time they’ll have to set aside for the video shoot, in advance. Of course the amount of time necessary is variable and will depend on what they’re doing on camera. For an exec, if their part is relatively short, I find that 1/2 hour, give or take, not including make-up or clothing adjustments is often adequate. 8. Have your on-camera talent bring an assortment of clothing. 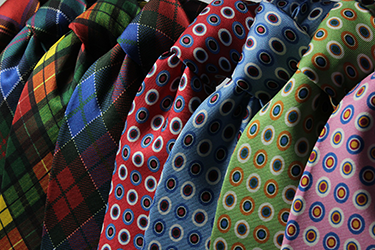 You may wish to have men bring an assortment of shirts and ties to see which looks best on camera. Of course women can do the same with an assortment of blouses, dresses, etc. You’ll also want to share the following article with them, which describes some rules for choosing clothing for an on-camera part. It’s called Wardrobe Tips for Your Video Production. 9. Have your on-camera talent avoid long necklaces, etc. Anything that is long enough to sit near a clipped on microphone can hit the mic and cause sound problems. It’s better to avoid this kind of jewelry so that you can avoid any rustling sounds. 10. Plan to have only those people on-set that your on-camera talent feels comfortable with. Of course the video crew will have to be there, but if it’s at all possible, in advance of the shoot you may want to talk to the on-camera talent to find out what their comfort level is. If there are people who they will feel self-conscious around, and if you can have them stay off the set, do so. Politically speaking, this can be tricky though, so use common sense when it comes to closing the set. So if you follow all of these guidelines, you’re much more likely to have a great experience and a positive outcome. Do You Need a Video Produced? Check out what makes us your best choice of video production company for your project. If you need an experienced and professional team for your next video, give us a call! We’d be happy to talk with you, give you a free quote and some ideas as well. There’s no obligation at all.